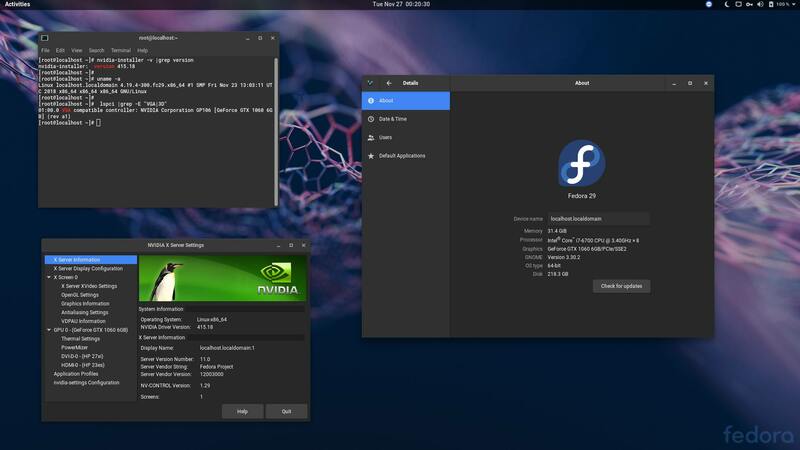 Driver installation complete and work good,But Fedora 29/28/27 Nvidia Restore Plymouth (BIOS/UEFI Users)” didn’t work by this way on fedora 29.It seems only boot menu uses specific resolution,after boot option selected and boot,the screen resolution is still in low resolution(or in text mode). I try to take some time and test if this even possible to fix currently. This method worked earlier, but looks like it’s not working now. It doesn’t work for mobile GTX 1060, though. Graphical mode doesn’t load. I had to enable secure boot to prevent loading the driver. Unfortunately nVidia doesn’t have real Linux support for nVidia Optimus devices. Upon initial release I installed F29 and used this guide with great success. I upgraded recently and it brought my kernel up to 4.19.3. The 390.87 patched installed mentioned in step 2.1 was a new addition. Simply downloading the patched installer did not work with DKMS and previous steps. I overcame this by moving my default NVidia installed to NVIDIA-Linux-x86_64-390.87.orig.run, creating a symlink to the patched installed using the default installer file name (NVIDIA-Linux-x86_64-390.87.run), and rebooting. This allowed DKMS to automatically rebuild the module with the patched installer. Thanks very much for this very thorough and detailed guide. Maybe easier solution is uninstall and reinstall nVidia drivers, but nice to hear that you got it working. This line below gave me “404 Not Found”. I hope someone can help. Yes, currently it’s unavailable, but before uploading this back I have to ask first, do you have Fedora 25 or Fedora 26/27 with compatible kernel? Does this manual also apply to Centos 6? Actually no, there is not nouveau on CentOS 6. But with little modification this installation method should work with CentOS 6 too. Hi, I had a problem. I arrived at step 2.8.2 on runlevel3; but when I ran the NVIDIA driver it gave me a checksum error. Then I executed the command in part 2.9. But now it does not start fedora, there is the black screen with 3 white points in the center, which then remain red and does not respond. How can I solve that. Try to download nVidia driver again, because your error sounds like it is corrupted on download. You can’t boot back to graphical environment, because you have uninstalled nouveau, your open source drivers. Saving everyone’s life. Thanks for the most updates tests, really saved my life. Hi, first of all, thanks for posting your guide. I had some problems in the end. I followed the guide (dnf update to latest, disable nouveau, Generate initramfs, Reboot to runlevel 3, ./NVIDIA-Linux-x86_64-390.87-patched.run, etc) but the screen came up blank after reboot. I managed to recover by deleting the xorg.conf file. I found another version here https://bbs.archlinux.org/viewtopic.php?id=223581 but it only shows about a quarter of the display. It’s a Dell XPS 15 L502X from 2011 (pretty old). Unfortunately you have nVidia Optimus device and it’s not supported by nVidia Linux drivers. So you can install drivers, run cuda apps and do some offscreen rendering, but you can’t run X. Check step 1.2 NVIDIA Optimus Technology for more information. Everything seemed to work pretty dang smoothly, and I am running on a Dell Inspiron 7559 which I believe has nVidia Optimus technology. Unfortunately though, I do not think something worked out correctly, as my GUI animations have basically disappeared and I cannot find the Xserver application for nVidia anywhere… Any ideas? Yes you have nVidia Optimus card and nVidia’s Linux drivers doesn’t support Optimus technology. Only cuda apps and offscreen rendering is supported, not any graphical environment. Linux Kernal 4.19.5-200.fc28.x86_64 crashed the NVIDIA 390. I had to load the version 415.18 (beta) for the system to work.